Pilots hold a giant trump card in their battle with American Airlines: They fly the planes. And even though cancellations aren’t widespread, they’re enough to give people a reason not to book American when given a choice. Amid labor strife, ongoing bankruptcy proceedings and layoffs, American Airlines has canceled hundreds of flights through October. The airline, whose parent company AMR filed for bankruptcy last year, said Wednesday it is reducing its flight schedule for the rest of September and October by 1% to 2%. 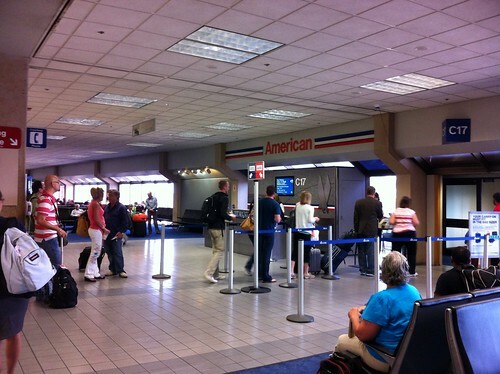 American’s flight schedule will be reduced until the end of October. Photo by Grant Wickes. Between Monday and Wednesday, the Fort Worth-based airline had already canceled 271 flights, according to the website Flightaware.com. Travel experts suggest American Airline passengers check the status of their flight with the airline and sign up for online flight updates. The airline is forced to nix hundreds of flights because of an increasing number of calls for maintenance work filed by flight crews and a surge in pilots calling in sick, according to an airline spokeswoman. “We are constantly evaluating our schedule based on operational and staffing resources, as well as seasonal demand, making adjustments when necessary,” spokeswoman Mary Frances Fagan said. The cancellations are only the latest turmoil for one of the nation’s largest airlines. The airline recently won a judgment from bankruptcy court to throw out its union contract with pilots. The airline also announced recently that it was sending out 11,000 layoff notices to employees, as part of a cost-cutting effort previously announced. In a statement issued Tuesday, the president of the pilots union criticized AMR, saying the airline company is only playing “lip service” to reaching an agreement with the union. “The pilots of American Airlines are angry,” union president Keith Wilson said in a statement to the pilots group.